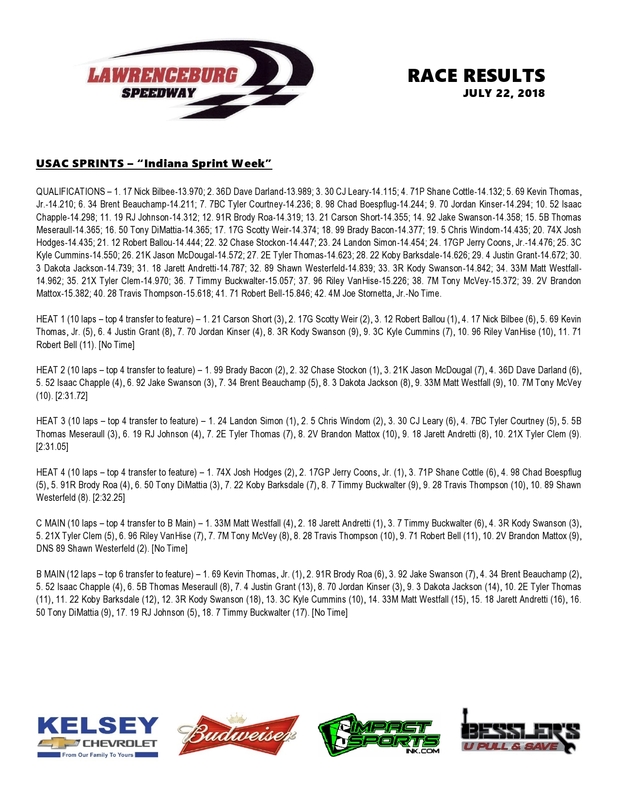 Sunday night at “The Burg,” a glance at the stats show that Courtney started from the front row and led all 30 laps in his Clauson Marshall Newman Racing/Priority Aviation – NOS Energy Drink/Spike/Rider Chevy. Some say stats don’t lie, but sometimes, yeah, they don’t actually tell the whole story. Hamilton Picks up 4th Win of Year! Aurora, Indiana’s Matt Hamilton has been the dominate Modified in 2018 at The Lawrenceburg Speedway. 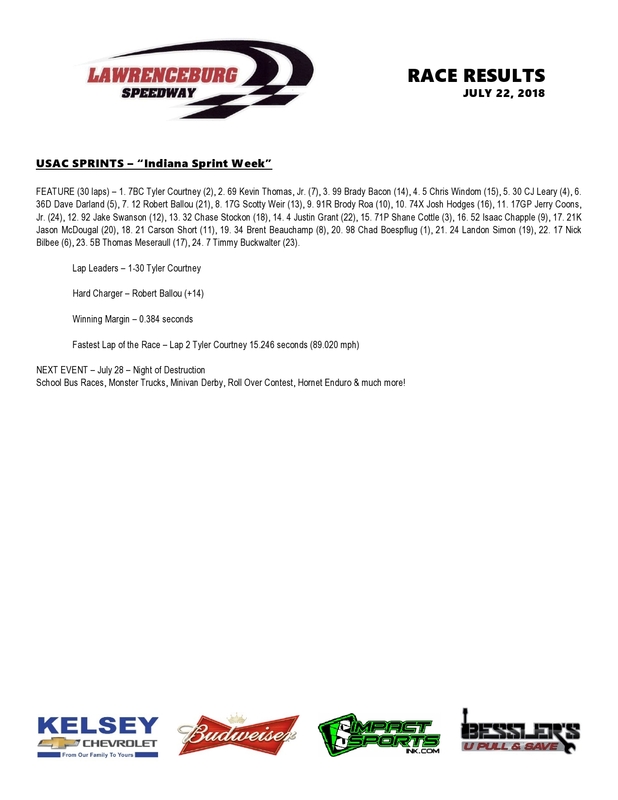 His feature win on Sunday night as the support class for USAC Indiana Sprint week was his 4th of the year and 21st of his career at the 3/8 mile track. Also with the win, Hamilton takes over as the point leader for the 2018 Budweiser UMP Modified Track Championship. As a former track champion at Lawrenceburg, Hamilton doesn’t necessarily race for points but after his dominating performance, he may change that. He would roll of 4th in the 20 lap feature and quickly take the lead on the opening lap and lead all 20 laps on his way to the feature win. 18 cars took the green flag and for several laps, Late Model driver, Scott James kept pace with Hamilton before Hamilton pulled away around the halfway point of the race. Scottie Williams finished third, followed by Jason Hollon, and defending track champ David Spille who rounded out the top 5. Heat race winners were Hamilton, James, and Scotty Kincaid. 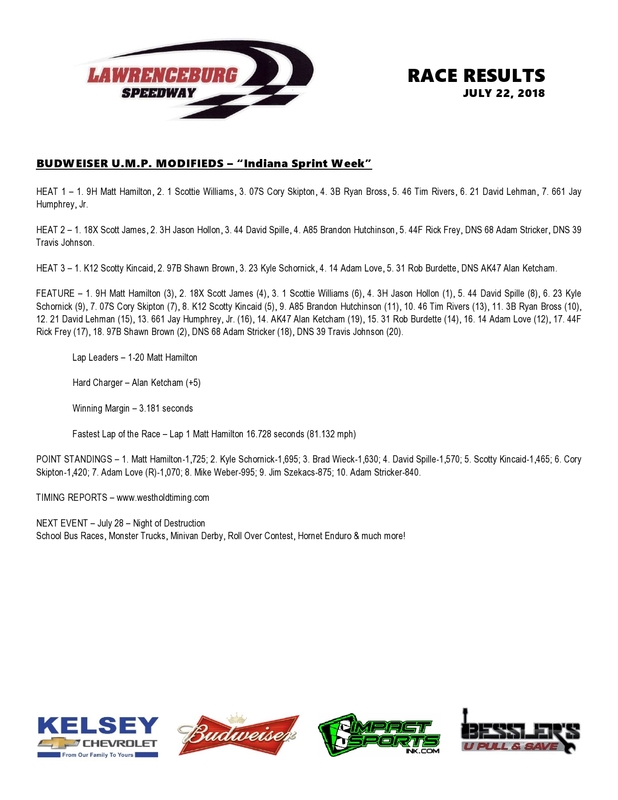 The Budweiser UMP Modifieds return to the track on Saturday August 4th.